Now Oregon entrepreneurs have access to office space, strategic partners, investors and other resources in the Boston market. Likewise, Massachusetts startups can get temporary office space at Oregon BEST offices in Portland’s Pearl District and be hooked up with faculty and lab equipment at the University of Oregon, Oregon State University, Portland State University and Oregon Tech (Oregon Institute of Technology), Oregon BEST spokesman Gregg Kleiner said. Oregon State University, home of Benny the Beaver, last fall raised $30,000 from fans, alumni and others to sequence the American beaver with a crowdfunding effort that was promoted on Facebook, YouTube and Twitter. Sequencing the beaver genome could help answer questions like why the rodent’s two front teeth are orange, why it has special dam-building skills, and why it loves to chew wood. Locally, Dune Sciences, Nemametrix, Avant Assessment and many other companies trace their core technology to research conducted at the University of Oregon. Similarly, Oregon State University can point to numerous “spinouts” linked to its research portfolio. “It’s a process of natural fixatives in the resin,” George Poinar, an entomologist at Oregon State University known for his research on amber fossils who was not part of this study, tells the Monitor. “[The resin] contains preservatives that enter into the tissue,” he explains. “At the same time, the sugars in the resin withdraw moisture from the specimen.” Those two processes preserve the tissue of the organism as the amber hardens around it. “When you start seeing petitions with hundreds or thousands of signatures, that’s an indication something is wrong,” said David Hurwitz, an associate professor of transportation engineering at Oregon State University who studies traffic signals. Rodney Bloom, a volunteer with the Compost Specialist program at the Oregon State University Extension Service in Lane County, says bokashi has been used for centuries in Korea and Japan. It uses a variety of bacteria, fungi and other beneficial microorganisms to ferment food waste in an anaerobic (or oxygen-free) environment. When the slugs are chomping the hostas or the weeds have taken over the garden, get the answers you need with Ask an Expert, an online question-and-answer tool from Oregon State University’s Extension Service. Hoover Elementary School had gone so long without repairs to its running track and baseball field that the school’s faculty and staff starting calling the area “the mud pit.” But thanks to the work Saturday of more than 50 volunteers from Oregon State University’s athletics programs, students going out for recess Monday will be able to enjoy a completely refurbished woodchip running track, baseball diamonds, butterfly garden and duck houses. Oregon State University — Cascades ornithologist Matt Betts will present “Hummingbird Highways: Conserving Pollination in Tropical Forest Landscapes” at The Belfry from 6 to 8 p.m. March 15. The agenda for Monday’s meeting includes a discussion of a new report the district is commissioning from Oregon State University, which will study how digital devices can be used more effectively to improve student learning and analyze what has worked about the program and what its challenges are. The study is expected to be completed this fall. NEW! RecycleMania: RecycleMania – an annual 8-week Civil War and national recycling competition between universities – is running Feb. 7 – April 2. Help OSU compete – and catch up to UO who is currently ahead – by recycling, composting and reducing your trash! Event this week: Get Caught Recycling at surprise times and locations, March 7-9. NEW! Corvallis Sustainability Coalition Town Hall registration deadline is Monday, March 7. Register today for the community sustainability event of the year, taking place Thursday, March 10, from 7-9 p.m. at the CH2MHill Alumni Center! Check out the 5-7 PM Sustainability Fair right before the program. Town Hall 2016 will include a “Community Scrapbook” featuring community sustainability accomplishments and an interactive program. This event typically draws a standing-room-only crowd: register today. Labyrinth walk: An open Labyrinth Walk will be offered to the OSU community Monday, March 7, 10 a.m. – 2 p.m., in MU Room #13 (multipurpose room on the ground floor level of the newly remodeled portion of the MU). Claim some time to let go of the stresses and find a focus or experience a centering for your life and work. Free. Hosted by United Campus Ministry at Westminster House. University Research Computing Seminar: Profs Kyle Niemeyer and Liang Huang, OSU, will speak on “Making effective use of graphics processing units (GPUs) in computations,” 2-3 p.m., Monday, March 7, in Kidder 202. They’ll explore the use of GPUs, describe examples of the use of GPUs in computations and introduce some best practices. This will be streamed at: http://live.oregonstate.edu. They Might Be Giants: Fossils, Mythology, and National Identity in Early Modern Europe: In 1613, “monstrous” bones were discovered by stonemasons digging near the castle of Chaumont in France. For years, a pamphlet war raged between those who claimed they belonged to King Teutobochus, the legendary giant, and those who argued they were the remains of one of Hannibal’s elephants. In this Center for the Humanities guest lecture, Anita Guerrini Horning Professor in the Humanities, and History of Science faculty in OSU’s School of History, Philosophy, and Religion, will discuss the historical context of this controversy and the science and politics that fueled similar debates well into the 18th century. Monday, March 7, 4 p.m., Autzen House, 811 SW Jefferson Ave.
NEW! Thomas Kinkade reception: Works by painter Thomas Kinkade will be on display in the Giustina Gallery in The LaSells Stewart Center Feb. 23-March 15. The exhibit is titled, “What will last? Original works from the Thomas Kinkade Collection.” A reception will be held from 6-9 p.m. Wednesday, March 9, in the Giustina Gallery. Members of Kinkade’s family are scheduled to attend. NEW! University Chorale: Join the University Chorale for an evening of song, 7:30 p.m., March 9, First Congregational Church, Corvallis. This term’s performance is unique in that none of the pieces will be sung in English. Languages include Chinese, Serbian and Hebrew among others. NEW! Current Issues in Post-Secondary Education: Tony Van Vliet, past member of Oregon Board of Higher Education, OSU faculty, and nine-term Oregon legislator will moderate a panel on changes in post-secondary education and independent boards. Panelists include representation from OSU and LBCC. Tuesday, March 8, 7 p.m., Corvallis-Benton County Public Library, 645 N.W. Monroe Ave.
NEW! Webinar – Alcohol: The Way You Define the Problem Influences Your Solution: The advent of clinical trials and alcohol epidemiology in the middle of the last century has led to an explosion of knowledge about alcohol’s effects on individual and public health. The way most Americans understand the root of the problem, however, has not incorporated that knowledge. This webinar will describe not only how our prevailing framework impedes progress on reducing the impact of risky drinking on individuals and society, but also how focusing on alcohol consumption guidelines is a promising model to facilitate progress. March 9, 10-11:30 a.m., Memorial Union 215. NEW! Ecampus Faculty Forum: Take part in a showcase of excellence in online teaching and discover techniques you can use to improve your online courses on April 13 from 8 a.m. to 4:15 p.m. The interactive sessions at the CH2M Hill Alumni Center feature OSU colleagues sharing innovative teaching methods and course development best practices. Includes breakfast and lunch with a keynote address by Jan Plass, chair of Digital Media and Learning Sciences at New York University. Register by April 10. NEW! Permaculture Design Online Already Half Full! The versatility of permaculture is astounding. From urban balconies and 100-acre ranches to your backyard, permaculture techniques can transform any landscape with sustainable, ethical, whole-system methods. OSU’s own Andrew Millison leads this ten-week course, helping students create a unique and extensive site design. Click here to view student examples. NEW! 100% of Our 2015 HR Certification Test Preparation Course Participants Are Now SHRM Certified. Demonstrate your knowledge, skill and leadership in HR to current and prospective employers with a SHRM certification! Our prep course features Oregon’s only SHRM-approved instructor, Dennis Carr, and a FREE SHRM Learning system package (an $854 value). 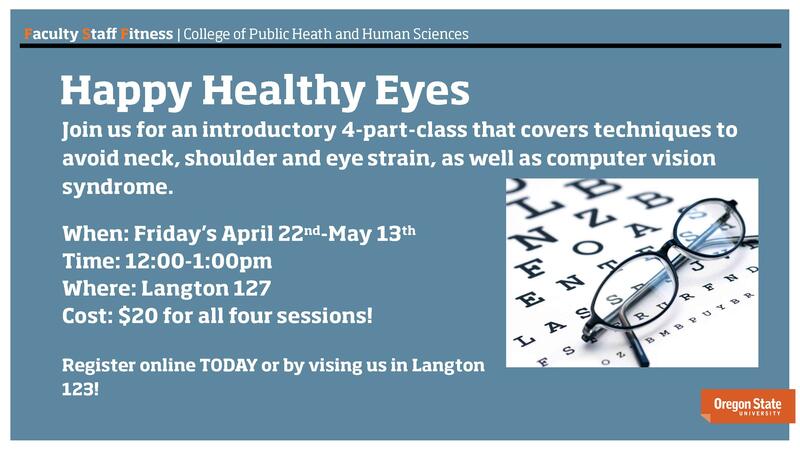 Hurry, our next session starts March 28. Register now. NEW! Association of Office Professionals Monthly Merit Award Nominations: Nominations for classified or professional faculty to receive a monthly Merit Award are now being accepted. The award recognizes and encourages outstanding performance in the work place. The nominator may be anyone from the campus community. Potential qualities include great working attitude, cooperation, courtesy, creativity, flexibility, professionalism, quality of work, sense of humor, and other qualities the nominee admires. Nominations are due by the 10th of each month. For more information: http://oregonstate.edu/aop/awards-recognition. NEW! Faculty Staff Fitness Spring Registration is now open! Be sure to check out our offerings & register online here. 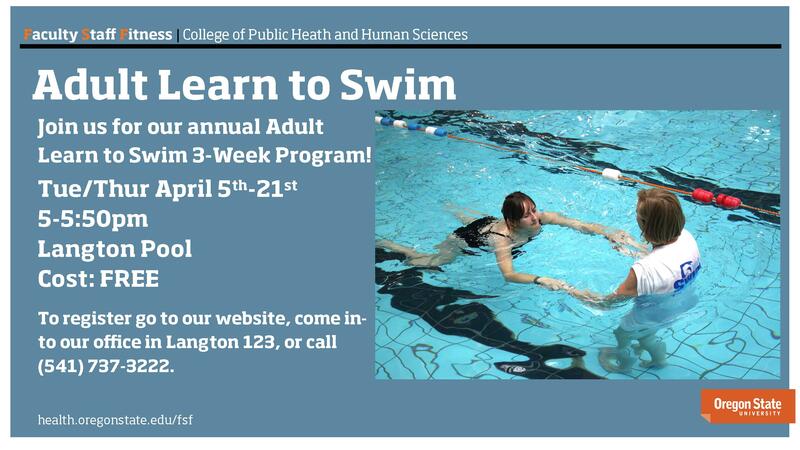 Seasonal offerings include Happy Healthy Eyes, Adult Learn to Swim, & Couch to 5K, sign up today! Faculty Regalia Reminder: The OSU Beaver Store is now taking Faculty Regalia orders. Place your order online at http://osubeaverstore.com/faculty/regalia/. The deadline for orders is April 15. Orders submitted after April 15 may see substitutions with gown size and/or hood colors. For further questions email faculty.regalia@osubeaverstore.com. Save the Date! Moms & Family Weekend: Mark your calendars for Moms & Family Weekend APRIL 29th-MAY1st. The Memorial Union Program Council is working on the schedule for the printed and online Moms & Family Weekend program and needs any events or activities you want to be included in the program. Again, please be sure to send your event/activity names, times and locations, to stacey.wai@oregonstate.edu no later than March 14. Monthly Emergency Preparedness Bulletin – Suspicious Objects and Bomb Threats Bomb threats, suspicious objects, and bombs are meant to disrupt normal activities and cause fear in populations. With pre-planning, you can remain calm and be knowledgeable of what to do in order to part of an effective response. Download a copy of the Bomb Threat Checklist and keep by your phone. Download this month’s Preparedness Bulletin at http://emergency.oregonstate.edu/preparedness-topics for more information. NEW! 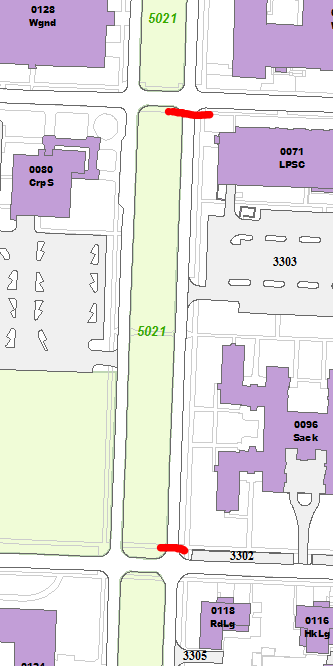 30th Street: Due to tree maintenance, the northbound lane between Campus Way and Jefferson Street (View Map) will be temporarily closed Tuesday, March 22, 7 a.m. – 3 p.m. For questions or comments on this closure, contact Bill Coslow 541-737-3488. Office Specialist 2– The Faculty Senate invites applications for a full time (1.0 FTE), 12 month, Office Specialist 2. Posting #P00107CT. Closes March 14 with full consideration date of March 7. Medical Lab Technologist: Student Health Services invites applications for a full-time (1.0 FTE), 9-month, Medical Lab Technologist, Posting #P00078CT. For full consideration, apply by March 7. Closes March 31. NEW! Office Specialist 2 – Integrative Biology invites applications for a full-time (1.0 FTE), 12-month, OS2. This position is responsible for the coordination of travel, hourly hiring and payroll processes. Posting #P00096CT. Closes March 25. NEW! Assistant Vice President for Research Integrity – The Vice President of Research Office is seeking an Assistant Vice President for Research Integrity. This is a full-time (1.0 FTE), 12-month, fixed term professional faculty position. Posting# P00095UF. Closes April 28. Corvallis: “A pessimist is a man who thinks everybody is as nasty as himself, and hates them for it.” ~ George Bernard Shaw. Showers today, high of 54, low of 37. Rain and patchy fog tomorrow. Central Oregon: Chance of rain and snow today, high of 42, low of 25. Chance of showers and then rain and snow likely tomorrow. Newport: Showers today, high of 51, low of 44. Rain tomorrow.